In the wake of the 'Mankading' incident involving Ravichandran Ashwin and victim Jos Buttler, IPL chairman has claimed that it was decided prior to the tournament that dismissal of such nature would not be valid. Kings XI Punjab skipper Ravichandran Ashwin has drawn a major controversy after ‘Mankading’ Rajasthan Royals’ opener Joss Buttler during the matchday four of the Indian Premier League (IPL), on Monday. 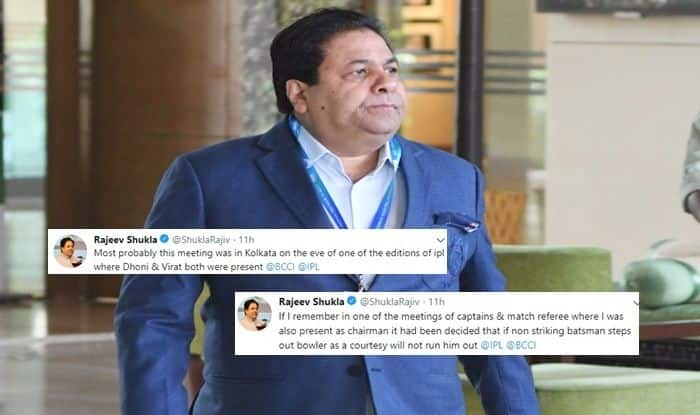 In the wake of the incident which sparked outrage on social media, IPL chairman Rajeev Shukla has claimed on his official Twitter handle, that prior to the tournament, in a meeting attended by the IPL captains, match referees and himself, it was decided that dismissal of a batsman through ‘Mankading’ will not be valid. Rajeev Shukla also stated that Indian cricket veterans MS Dhoni (Chennai Super Kings skipper) and Virat Kohli (Royal Challengers Bangalore captain) were present in the meeting. The incident has sparked outrage on social media with veteran cricketers, pundits, and fans weighing in with their take. Several also urged the IPL chairman to take suitable action against the match referee who gave the decision, and Ashwin.